This sealopen letterCall Facebook to open the ad archive API to make it easier to analyze political ads and identify sponsors of political ads. Mozilla said, "We have the right to know who is paying to influence our vote, Facebook is responsible for ensuring that this happens on their platform," and accuses Facebook of saying nothing. We are writing to you today as a group of technical experts, human rights defenders, academics, journalists and Facebook users who are deeply concerned about Facebook’s commitment to protecting European users from targeted false campaigns during the European Parliament elections. Effectiveness. 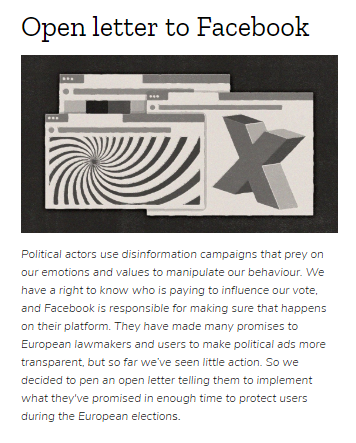 You promise to European legislators and users that you will increase the transparency of political advertising on the platform to prevent abuse during elections. But at the same time, you take steps to block access to transparency tools and let your users know their goals. Action is better than empty talk. This is why you must act and meaningfully fulfill your commitment to the EU institutions, especially if you promise to increase transparency. Commitments and press statements are not enough; instead, we need to see actual actions in the coming months, and if the actions are not sufficient, we will explore ways to get Facebook accountable. Launched a full-featured open ad archive API that supports advanced research and development tools to analyze political ads for Facebook users in the EU. Ensure that all political advertising is clearly differentiated from other content, with key target criteria such as sponsorship status and the amount spent on the platform by all EU countries. Stop harassing goodwill researchers as they are building tools to increase the transparency of platform advertising. We believe that Facebook and other platforms can be a positive force in achieving democracy, but this vision can only be achieved through true transparency and trust. 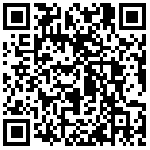 Transparency is not just about making the world's largest and most powerful technology company feel most comfortable. We look forward to the rapid and complete implementation of these transparency measures that you are committed to. Mozilla early is how to break the monopoly market?